BANG! Slightly hung-over from drinks on Insatiable 2, we were rudely waken from our early morning slumber. “What was that! ?” A loud bang on a yacht is NOT something any sailor wants to hear. It usually indicates some form of major and life-threatening damage – hitting something, mast down, engine blowing up. BANG, BANG, BANG! The sound of galloping hooves. We look out the hatch and there is a herd of wild horses galloping along the beach and up the hill. My first thought was that someone was herding the horses using explosives? Then I saw a man holding a rifle, BANG, BANG, BANG, and a herd of frightened deer bolting away through the thickets towards the other side of the island. It looked like they had escaped, but then I noticed a deer lying prone on the ground with another hunter approaching it. The 6 hunters then all stood still like statues, guns at the ready. The drama had only just begun to unfold. At time of writing this the swell is a bit down and a couple days of Westerly winds forecast so we decided to cut the cord with the surfing of Ouano and move a bit further afield, at least for a while. On Thursday night (3 September) we had a bit of an “au revoir” dinner party on Jolifou with Perret, Patrice, Ness and Pete featuring Lyn’s world famous slow roast lamb, roasted pumpkin with sesame seeds. Perret had brought gelato for desert and this was a rare treat with Lyn’s berry sorbet. The red wine and interesting conversation flowed. Patrice enthralled us again with his conspiracy theories and explanation of his archaeological work. He has been studying ancient cultures such as the Aztecs, Incas and Mayans for over 30 years and he analyzes drawings and symbols on rocks (including local finds) extracting images, which often prove his theories of an extraterrestrial presence cooperating with mankind at that time. We love his obvious passion for this work and are fascinated by the topic but the jury is still out on whether we are totally on board with this. We will look at his website http://www.ultimate-archeology.com with an open mind when we have a good internet connection. In the morning a nice south westerly wind gradually filled in across the lagoon, perfect for our sail southwards to St. Vincents bay. Insatiable 2 had the same plan and they do say that if there are two cruising boats headed in the same direction then there is a race on! Insatiable is a 46 foot cutter with lovely racy sleek lines and Jim would have fancied his chances, but ultimately Jolifou taking a short cut inside Konduyo island as the wind backed more to the south gave us a better wind angle which translated to an unassailable lead (horizon job?). We later heard that Jim spent a day cleaning his bottom as a result of this defeat. We needed to top up the diesel a bit so sailed to Port Quenghi marina at the bottom of the bay, which is suitable only for shoal drafted vessels. Even with the small draft of Jolifou at 1m (board up) we had a few white knuckle moments on final approach to the marina entrance as we zig-zagged down what appeared to be the deepest channels in the muddy water. No English and no credit cards here so we handed over all the cash we had and managed to communicate to the nice French man to give us as much diesel as that would buy. We got 114 liters for 13000 cfp, which actually is a rather good price when compared with Australia (somewhere around 150 dollars). We spent the night in Moustique bay on Ducos island, which is a lovely anchorage, and had a delicious curry dinner on Insatiable 2 with Anne and Jim. Saturday morning was the deer hunting show. We had front seats to the drama which was unfolding in a basin in the land really close to our anchorage position. The main herd of deer had escaped to safety during the initial salvo, but a few poor stragglers remained, frozen and hiding in the thickets. This the hunters knew, and they waited patiently. A deer would be spooked from its hiding spot into the open by a hunter approaching or just plain losing its nerve. Then all hell would break loose with hunters firing numerous rounds at the fleeing animal. I must say that I think most of them were very poor shots because often the deer would actually make it to safety unscathed despite not being particularly quick or nimble in their fleeing. It was almost farcical but eventually they would find their mark, usually only injuring and laming the poor animal, which would then pathetically stumble around trying to escape its inevitable fate. On one occasion a blood thirsty hunter indulged his perversion by finishing the defenseless animal off cutting its throat with his hunting knife. What a man! Deer hunting is quite prolific in New Caledonia. Deer are obviously not an indigenous species and back in the day after they were introduced to New Cal there was a time that they were a bit of a pest, destroying the indigenous vegetation. In some cases they apparently spread to different islands by swimming to escape a fire at their original home. So historically the hunting of deer has been encouraged to keep the population down. In more recent years private land owners have stocked their land for their own sport and food, and in some cases there are commercial operations with foreign tourists paying to hunt. We hate the act of hunting and cannot condone it, even if the deer are bred for that purpose you cannot justify the cruelty of killing them in an often painful way. By around about midday, the hunters had killed enough. Four deer in total were dragged down the hillside and loaded onto their smallish tinny, plus the 6 hunters, and they set off slowly back towards the mainland. Their families would eat venison that night (and presumably quite some nights into the future). We took the opportunity to head ashore for a walk, climbing up the steep ridge of the nearby hill/mini-mountain. Near the top there is a magical area of rock and trees where we were able to indulge our rock-climbing passion a little before summiting to a marvelous view of St. Vincent’s bay and surrounds. We had a good view of the arrival of our friends on Eos 2 in the anchorage before we descended down the other ridge. That night we had Anne and Jim of I2 and Lani, Slade, Keani and Amahikai of E2 for dinner on Jolifou, a tasty and merry affair as always, featuring Moroccan chicken and Lyn’s delicious first attempt at baking fresh sourdough bread rolls. Moustiques Bay, JoliFou, EOS 2 and Insatiable 2. On Sunday the 6th we awoke to a forecast of a southerly wind direction (rather than the prevailing south-east) and decided to use it to continue south eastwards towards Noumea. With the prevailing south easterly winds here it is really easy to travel north westward up the lagoon, but when it comes to the return one needs to use every opportunity to avoid a windward slog. Early on there was no wind at all and we motored through St. Vincents bay enjoying the passing scenery of the bay islands. It was glassy windless conditions out in the lagoon so we decided to head out to the reef at Uitoe pass and anchored in a gorgeous spot just inside the reef. Bruce noticed that there were a couple of surfers riding the right-hander on the reef and took the dinghy out there for a surf. A fun little wave but nothing like as good as Ouano. Lyn explored the reef on her paddle board. Shortly after returning to the boat a cloud bank came in from the South accompanied by a gusty southerly change and suddenly this was no longer a good place to be! 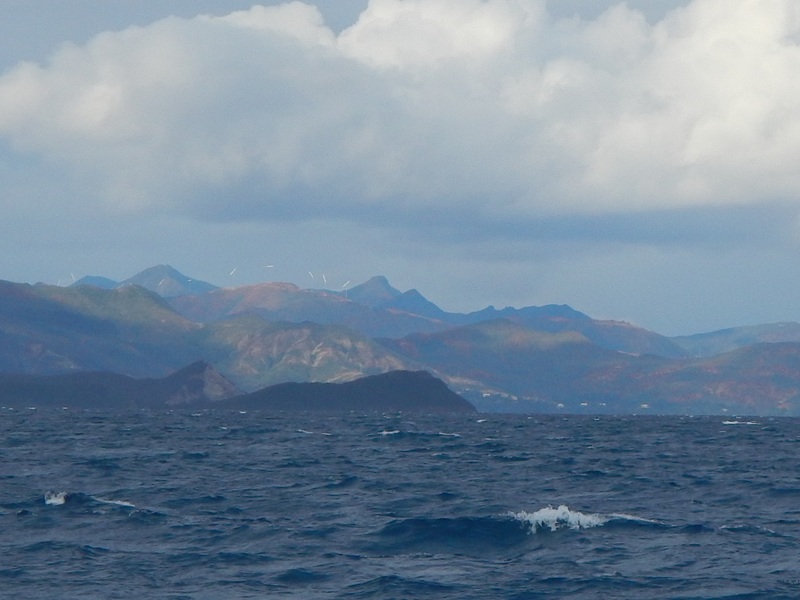 We upped anchor and sailed with headsail only to the excellent sheltered anchorage of Maa bay, just before Noumea. We had a nice quiet night there despite a French boat inexplicably wanting to anchor right on top of us in a huge anchorage with only one other boat. Next morning we left early for the short motor to Noumea before the wind came up. We filled up with diesel at the CNC marina (yacht club) and then anchored in Orphelinat bay. We took the dinghy to drop Lyn at the supermarket for a big stock-up shop and Bruce continued on across the bay to the chandlery for some odds and ends. We learned that Aussie gas tanks can be filled by Noumea Yacht services (no one else does it and Herve fills by gravity feed from a local bottle). That evening we decided to treat ourselves to dinner ashore. In Citroen bay we found a really nice bar (called La Barca) which has excellent atmosphere and is obviously popular with the locals. It was surprising to see the number of locals out on a Monday night. Our mistake was eating there as the tapas menu food was really ordinary! On Tuesday the fresh food market was open and Lyn completed her stocking up mission. We picked up the gas tanks and were treated to the drama of a fire on some old tug boats in the harbor, which we had front seat views to as we bought dinghy fuel at the fuel dock. We had intended leaving Noumea for Prony bay that afternoon, but the easterly was blowing strongly so we elected to remain another night. With the wind from the north east the next morning, we decided to head out for the famous Amedee island near Boulari pass, a really pretty island with excellent coral very close to the moorings. When we arrived we were the only boat there and Lyn lost her hat whilst we were deciding on a mooring in the roughish waves and it sank before we could get back to it. Bruce dove for the hat and had a bit of a look around seeing a few sucker fish that had decided to adopt the Jolifou. They are funny looking fish and not very perturbed by humans. We took the dinghy ashore, rescuing the New Zealand crew of “Guchi” on the way as they struggled to row against the wind and waves. At the dinghy beach we were treated to the spectacle of three small white tip sharks over the shallow reef and also three sea snakes in the nearby rocks. We walked around the island marveling at the lighthouse, which is an impressive structure but was unfortunately closed to public access. It is an extremely beauitiful island, unfortunately spoiled by some fake touristy infrastructure. There is a cordoned off food area reserved for the people who pay for the tour out on the ferry boat, complete with waiters dressed up in grass skirts, Polynesian music band etc. – very cruise ship touristy and not what we like at all! That afternoon, with the wind staying in the north east we decided to head back to the mainland for the night. Uere Island was as good as we could lay without a rough sail. A sucker fish came along for the ride, remaining attached just off the stern all the way across. Even after we started the engine it remained in place and only left us after enduring the prop wash for quite some time. Uere island anchorage is excellent protection and a really scenic spot very close to Noumea. It took 2 attempts before we were able to anchor in a nice position evenly spaced between a small boat on a mooring and two swimming platforms, but it was worth it as we ended up nice and close to shore in a great spot. We had a nice peaceful night there in company of 3 other boats including our new friends on Guchi. Next morning a nice south westerly was blowing and we set sail eastwards for Prony Bay. More on that next blog. By jolifou in Uncategorized on September 17, 2015 .